Pulse and heart rate are terms that are often used interchangeably, but there is a notable difference between them–the heart rate can be seen, but the pulse rate can only be felt. The heart rate is the speed at which the heart is sending an electric impulse; on the other hand, the pulse is defined as the number of beats per minute that are sending blood to all parts of the body. This can be simply determined by feeling one of the pulse locations. Here, in this article, we can learn how these values are measured and what tools are used in the process–EKG rulers. Why Do You Need an EKG Ruler? One of the more conventional methods that are used to determine one’s heart rate from an electrocardiogram report is to use what nurses and doctors call the “box method.” Although this is considered to be the most accurate method, it requires memorization of a set of numbers, namely, 300, 150, 100, 75, 60, 55, 50, 45, 40, and 35. In this method, the first thing one must do is to find the pointy R waves, or QRS complexes, in the diagram. Next, in getting the RR interval value, the number of big boxes (5 x 5 boxes) between two R waves are counted. The easiest way to do this is to find an R wave that’s closest to the solid line. When using this method, determining the heart rate shall require checking how many big boxes there are, and using that value to divide the starting point of 300 bpm. For instance, 300 divided by over 3 boxes is around 75 to 100 bpm. Now, the problem is that whenever we talk about rhythm, we should think whether it’s regularly regular, regularly irregular, or irregularly irregular, right? To determine this, it isn’t enough to measure only one RR interval. One must always measure the shortest interval and the longest interval to get the range of heart rate. Here is where we will need the help of some useful devices. The EKG ruler is one such measuring device that can be used to assess heart rates easily, and with less memorization. The EKG Ruler is a tool that makes use of a procedure more or less similar to the more conventionally-used box method. The tool comes with the diagram of a basic electrocardiogram report labeled with commonly used terminology for easier understanding, along with an overview of various points on the ECG. As such, the ruler on one side is designed to measure the heart rate, while the ruler on the other side shall help determine the normalcy of common distances which include PR and QRS intervals, cycles, lengths, couplings, escapes, and parasystolic intervals. The EKG ruler can, therefore, be considered a highly versatile tool that can also be used in the analysis of ECG reports, as well as strip chart recordings. It isn’t an easy feat to pick the best and most appropriate EKG ruler, given a great many numbers of products available on the market. In buying a specialty tool such as EKG rulers, there are lots of things to check. Let’s face it, they all could be great. So let’s check out some of the important criteria that one needs to look into before committing to any one product. These are some of the most important information that’s necessary for an EKG or ECG reading, and hence, the EKG ruler one selects should have these values depicted in a clear and concise manner. While it’s true that the EKG rulers are specially designed for nurses or nursing students, it does not mean that they should be complexly-designed and not easily understandable. It is a reference material, and hence, the selection criteria should include the ease of use factor. They must be sturdy and easy-to-read and should be easily understandable for both the medical professionals and for the interested laymen. It would be good if the ruler you select is designed with the full-color scheme for the reading purposes. The EKG rulers are designed to EKG waveforms, and it’s important that they give us accurate measurements while tracing intervals. Since nurses are prone to water spilling on their duty, it’s important that the EKG ruler, which they will carry in their pockets to wherever they are needed, should be resistant to water. See to that it is made of durable plastic or select the ones that are laminated. Based on the criteria mentioned above, here’s a collection of EKG rulers that we can consider as the best of the best. Let’s take a look! This is the pocket student guide with seconds scale for PR intervals, QRS intervals, cycles, length, coupling, escape, and parasystolic intervals. 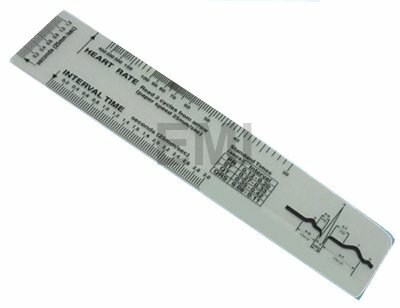 The EMI EKG Ruler #453 can be considered as one of the most excellent tools for measuring EKG strips, and it comes in a perfect size to be carried around in one’s pocket. Not to mention, all the appropriate information is inscribed on the handy, pocket-sized instrument. For its relatively inexpensive price, this EKG ruler is a wonderful tool, especially for nursing students or beginner nurses who want to learn rhythms effectively. One disadvantage of this ruler, however, is that the seconds are on the sides instead of at the top. Apart from this one shortcoming, the EMI EKG ruler should be the perfect pick. Some users claim that even though it cannot measure everything, it works for almost 99% of the strips. And, this ruler doesn’t poke holes in your uniform. So, it’s definitely worth buying. Though the writings on the ruler are somewhat small and difficult to read, it is still a very useful and handy tool. Surely, users will not have much difficulty in using this ruler. In simple terms, the EMI EKG ruler #453 ’s a precise and conveniently-sized EKG ruler, with no unnecessary information. An overview of EKG's, Basic Terminology, and EKG Ruler - all on a badge card! The product is available in two orientations–vertical and horizontal, thus providing both comfort and convenience based on individual preference for orientation The ruler on one side will help you measure the heart rate, while the one on the other side will help you determine the normalcy of distances, such as PR Interval, QRS Complex, and QT Interval. It is a double-sided model, which uses the whole printable region to maximize the complete information. The size of the EKG ruler is the same size of the credit card (3 3/8″ by 2 1/8″). The thickness will be about half of the thickness of your credit card, and hence, it won’t feel bulky in your pockets. This is made of durable plastic and hence, is waterproof. The standard pre-punched slot will work well with your badge clips and reels. As it comes in both vertical and horizontal orientations, you have the choice of buying whichever works best for you. It can be a wonderful addition to the nurses’ badge-buddy collection. Although in a majority of cases, the nurses will be using the ruler, the other side also is useful while deciphering complexes that are difficult to interpret. Overall, it’s a good quality EKG ruler package, which is detail-oriented, as well as handy. Thus, it’s suitable for all the nursing students, nurses, as well as other medical-related professionals to use during their everyday duties. Thus, we could say this purchase would be a value for money. 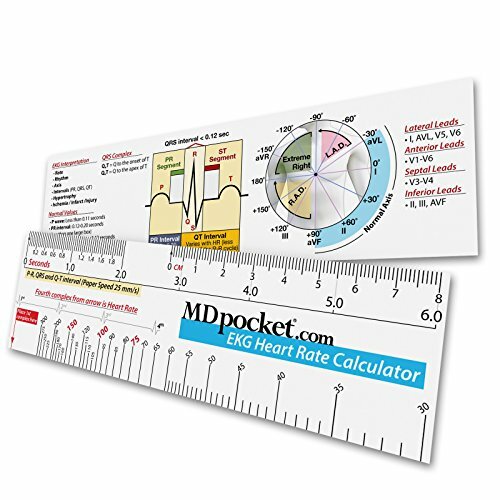 This is another EKG heart calculator ruler from MDpocket, with specific calculators for heart rate, PR, QRS, as well as QT intervals. This is an easy heart rate calculator, with a complete readout of heart rate down to 30. For the benefit of accurate measurement, there is an EKG axis determination diagram, with normal EKG values for measurements of P waves, PR intervals, QRS duration, QT intervals, and QTC intervals. Additionally, there is also a diagrammatic representation of the complex with areas labeled to help identify the intervals. According to our review, this can be said as a good quality EKG ruler, with great information. The size of the product is perfect to be fit nicely into your scrub pants along with your other reference materials. When you have these rulers, you don’t have to carry those bulky EKG calipers to your workplace anymore. As and when you take tests on your patients’ EKGs, you might not have the luxury of the data on the test prints you are looking at. Yes, they are chances that you are not allowed to use those bulky tools. But, if you have it in the form of EKG ruler, you can use it once in a while, so that you won’t forget all those numbers. Probably, when it’s just you and a calculator, you can use this ruler for quick calculation. 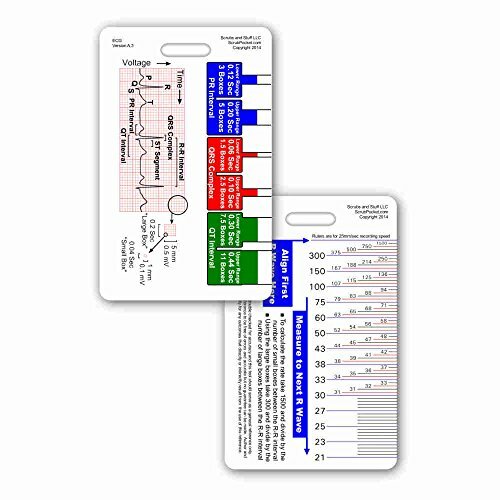 To put it simply, this EKG ruler, which perfectly sits in your pocket, is the most helpful tool for the nurses and nursing students who are still learning how to read EKG strips. Among the three, the best choice for nurses and other healthcare practitioners would be Scrubs and Stuff LLC’ EKG Ruler Badge. Firstly, the product is available in two orientations–vertical and horizontal, thus providing both comfort and convenience based on individual preference for orientation. Secondly, the EKG Ruler Badge is sold at a very fair price cheaper than the other two options, yet with almost all the same features and options. Thirdly, this particular tool is just the size of a credit card, and with only half of its thickness. The EKG Ruler Badge from Scrubs and Stuff LLC would perfectly fit your pockets without being bulky. And finally, it’s waterproof–objects that are waterproof save so much time, effort, and hassle for nurses and other healthcare practitioners who are always on the go in clinics and hospitals, with the ever-present risk of liquid spillages. Thus, from our criteria-based evaluation, we can confidently say that Scrubs and Stuff LLC gives definite value for money with its reliable product. © 2019 Long White Coat.